Born: July 21, 1944, Arlington Va. Personal: Married to Sheila. Three children, David, Marcia, and Mark. Education: Graduated with a B.A. in Political Science and earned a Ph.D. in Political Science, 1969, University of North Carolina, Chapel Hill. Political background: Elected U.S. Senate, 1990. Political ads for Sen. Wellstone's 1990 Senate bid set a new standard for political advertising. View four ads from 1990. Thousands turn out at memorial service. The crash of Paul Wellstone's chartered aircraft in Eveleth silenced one of the most original voices in national and Minnesota politics. Paul Wellstone died as he approached the final full week of campaigning for a third term in the U.S. Senate. Wellstone launched his uphill political career 12 years ago when he challenged incumbent Republican Sen. Rudy Boschwitz. Few observers gave the Carleton College professor a fighting chance against Boschwitz, who outspent Wellstone nearly five to one. But Wellstone's grassroots efforts, his earnest style, and his quirky campaign ads helped him squeak through. Wellstone campaigned on a distinctly populist message, and his famous green school bus became a common sight along the highways of Minnesota. On the night of his victory, he promised his supporters he'd live up to the trust they'd given him. "I will work so hard to live up to your trust. I will work so hard to do well by you. I will work so hard to be a senator that you will be proud of," he said. That upset victory began a political odyssey in which Wellstone achieved national stature as a defender of old-guard liberalism, but not before a rough ride in his first years in office. Wellstone traveled to D.C. in his trademark green bus and almost immediately found himself embroiled in the debate over the looming Persian Gulf War. Wellstone held a news conference at the Vietnam Veterans memorial to urge diplomatic solutions during the nation's original dispute with Iraqi President Saddam Hussein. "People do not believe that the case has been made right now for going to war," he said. Wellstone would take a similar stance earlier this fall when he opposed the current president's resolution seeking authorization for a military strike against Iraq. But at beginning of his first term, Wellstone's decision to use the Vietnam Memorial for a political statement outraged veterans' groups. He was building a reputation as a brash upstart who pushed the issue at inappropriate venues, and became an irritant to President Bush and Vice President Dan Quayle. In those first days, Minnesota's senior statesman, Walter Mondale, cautioned the eager new senator to take a step back. "In no sense should he remain silent when he wishes to speak out. No way, I don't want to be misunderstood. But, this is a difficult complex job, building influence and followership and mastering those issues takes time. And it is that approach that I would recommend to him," Mondale said. Early polls showed only 3 in 10 Minnesotans approved of Wellstone's early efforts. That ranks as one of the lowest approval ratings ever recorded for a Minnesota senator. But Wellstone showed he could rebound. During the remainder of his first term, he worked tirelessly to repair his relations with veterans, and fought for assistance for those suffering from post-traumatic stress disorder. His advocacy so impressed veterans that the national VFW endorsed Wellstone's re-election bid earlier this year. Wellstone's reputation as a populist increased with other Senate battles: his opposition to the 1996 Welfare Reform law that ended decades of welfare entitlements; his support for campaign finance reform; and, more recently, his opposition to current President Bush's tax cuts and his efforts to reform corporate governance. In 1996, Rudy Boschwitz returned for a re-match, using Wellstone's record to paint him as an "embarrassing liberal." But this time around, Wellstone won in a landslide. And despite the sometimes acrimonious debate, Boschwitz says he became a begrudging admirer of Wellstone's tenacity. During the '96 fight, Wellstone polished his image as a champion of the little guy. "If, from time to time, in order to change this system and have reform, I have to take on the tobacco companies, the oil companies, so be it! So be it! We'll do it! We'll do it," he said. Wellstone's star was rising. And during his second term, he embarked on a so-called "poverty tour" of the southern United States, a move that fueled speculation he might be laying the groundwork for a presidential bid. During the trip, he retraced the path of Robert Kennedy took decades earlier. Wellstone said he hoped to focus attention on the plight of poor Americans. "In a very real way, I think our nation -- certainly the Congress -- has turned our gaze away from the problems. And I don't think we can. I don't think we can. I don't think that's the goodness in our country," Wellstone said. "I said a long time ago, actually right after the first campaign, that it would be -- I would serve two terms for people. And I wanted to serve two terms for a variety of different reasons. You know, I look at our children and our boys I think will --- certainly our older son who has two small children is doing it differently -- but in my case, thank God our children are doing well. But I didn't spend enough time with our kids. They're all grown up. I don't want to make that mistake," he said. 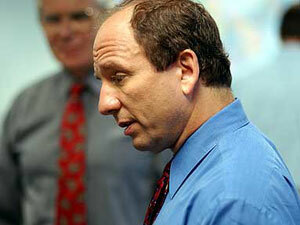 But last year, Wellstone made an abrupt about face when he announced he would in fact seek a third term. At the time, he cited the unusual political landscape: George Bush has just been narrowly elected president and the Senate was divided along a razor thin margin that eventually tipped -- just barely -- to the Democrats with the party-switch of Sen. James Jeffords, I-Vt.
"I very honestly believed then, that this would be the plan, that it made sense to give it everything for two terms. Just as I honestly believe now, just as I honestly believe now that who would have ever believed these circumstances?" he said. Wellstone more recently revealed that he had a form of multiple sclerosis that accounted for a pronounced limp, but he vowed not to let the illness interfere with his campaign or with his duties if elected. The match-up with Republican challenger Norm Coleman had, for most of the year, appeared to be a statistical dead heat -- although recent polling seemed to indicate Wellstone was pulling ahead in the crucial final weeks of the campaign. The race drew national attention, as one of a handful that could decide control of the Senate next year -- and was often marked by nasty charges between the two campaigns and a battle to dominate the airwaves. Wellstone's sudden death, however, now leaves a palpable void in the political landscape.